“PTSD and Traumatic Brain Injury, that’s basically the wound of Iraq and Afghanistan. The signature wound, if you will, is the TBI”, says Anthony Norris. On this edition of "Let’s Talk About It! Normalizing Mental Health Conversations," from the ongoing KSMU series Making a Difference, we meet Anthony Charles Norris, a graduate of Nixa High school. In 2006 during his senior year at Drury University, Norris chose to delay graduation and pharmacy school, to join the U.S. Army. 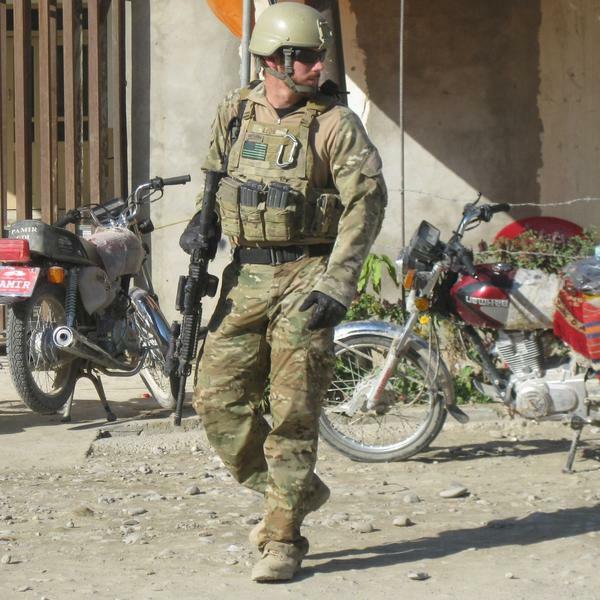 In the coming years between deployments in Iraq and Afghanistan as a member of a three-man Psychological Operations Team working Special Operations missions, Norris would earn Biology and Chemistry degrees from Drury. But in July of 2010, while Norris was in Helmand Province Afghanistan on foot patrol with U.S. Marines, an Improvised Explosive Device, an IED blast, sent shrapnel into Norris’ body and concussive waves into his brain. “Boom! And like, everything was dark brown," said Norris. “It didn’t knock me over. It didn’t knock me out. I’m not thinking I was even hit, at this point. Right behind me was my linguist and my junior guy, and we were in the middle of the patrol. They didn’t get hit at all. It was only me. And I literally opened my body armor, and had blood all the way down my chest," he said. A ball bearing had lodged in Anthony Norris’ neck. Rocks and gravel propelled by the blast pierced his skin. Norris sustained injuries to his legs, shoulder, arm and elbow. He had a heck of a headache. After getting patched up in the field, Norris and his team completed that day’s mission, and following further medical treatment, Norris did come home on medical leave, but was anxious to get back to his men and missions in Afghanistan. “Yeah, I could’ve left, but it wasn’t an option for me. I literally didn’t consider it," says Norris. “I actually came home on leave, shortly after that, but couldn’t tell anyone I was going back,” he said. “In combat," said Norris, “my job was nature for me. It wasn’t something I struggled or took a lot of brain power for me to do. It came very natural to me. And it’s simple; in combat you live or die. You don’t have to worry about bills or mowing the yard, you don’t have to worry about all the things we do here. And that’s why all the guys are like, I Want To Go Back. Because it’s simple, and easy," Norris said. Military medical personnel are literal lifesavers, in the field and the operating room, but it’s hard to patch-up wounds that can’t be seen. Even though he didn’t know it at the time, Anthony Norris was going to learn a lot about Traumatic Brain Injury. “There’s different types of TBI,” said Norris. “There’s the Concussion TBI, and then there’s the Blast TBI. They both share the same symptoms of Post-Traumatic Stress Disorder; memory loss, irritability, anger, depression, anxiety, insomnia, and the list continues. And so being in combat with a brain injury, I didn’t know I had a brain injury," he said. “So my navigational abilities are down to zero," said Norris. “Finding my house requires a GPS. Finding my keys, wallet and phone, requires my service dog. I can say Penny where’s my phone and she’ll bring it to me. She’ll bring my boots, that kind of thing. My legs give out, my arms give out, I fall over a lot, and I drop stuff. My brain shuts down for 3 day periods of time. I stay in the house and Penny takes care of me till my brain re-boots," said Norris. “I used to speak five languages, but now I barley read, write and speak English’, Norris said. “I can’t read or comprehend anything. I have to have it read to me to comprehend it. Now given, I have a Master’s Degree," he said. Norris and his wife divorced within his first year back, he says. “We split, and the physical and mental pain was getting worse. I couldn’t quiet the screams down. For a week I didn’t go to work. I didn’t eat. I just sat down and I drank," said Norris. “I didn’t take my meds," he said. “My gun was sitting there on the coffee table, and it was looking very desirable. Not that that’s the way I wanted to go, but that was the solution to end the screams, to end the pain. That would’ve fixed it all." A chance visit by Norris’ mother prevented what would’ve become a personal tragedy for the family, and that day’s heart to heart talk convinced Anthony to seek professional help. “I didn’t want to cause my mom that pain, so I agreed to go to therapy for her, and that was kind of the turning point," said Norris. “My therapist, Holly Billings, is phenomenal. She called me on my BS all the time. She told me she wasn’t going to let me be that Veteran who raises a fit in a restaurant because he can’t sit facing the door. You served the country by doing what you did. I’m going to serve the country by not letting you be that individual, she told me. And by God, she did." Anthony Norris says his therapist advised him to make a full accounting of what the IED blast took away. “I sold it short. All it was to me was a 'boom,' which hurt, and that’s all it was to me,” he said. “Holly said, 'Guess what? It’s more to you than that. You’re just not seeing it,'” said Norris. “'You’re no longer going to pharmacy school, you can no longer navigate to your house, and you’re no longer married. You have almost no memory of your childhood.' She told me, 'It’s more than that'”, Norris said. “My mental injury at that point, took a different perspective,” said Norris. “Because that incident was single-handedly what destroyed the life I planned and what I wanted to be, and I didn’t give it that. But when I started to give it that, this PTSD or mental illness started to really expand to where I could break it down and start to recover,” he said. Norris says he quit drinking alcohol and taking his pain medications. “Going off pain meds made the therapy start to take hold, because I was present. I haven’t been on pain meds in six years. The pain is worse, but I can handle it better,” he says. “The best medicine for the brain is using it,” said Anthony Norris. “The reasoning is to re-route the pathways of neurons by using the brain for normal things like grabbing this and drinking that, and comprehending what you’re doing. The only way to re-route that is by exercising your brain,” said Norris. “I had a fellow tell me there’s always a positive in a negative event,” said Norris. “You just have to find it. And it’s true, you focus on the positive. You search for the positive. That is what you find. It becomes a positive point in time which forms and shapes you to what you are today. You can’t ever get rid of that, and the negative is not so negative,” said Norris.